LATAM Airlines Group has taken delivery of its first Airbus A320neo at Airbus’s headquarters in Toulouse, France. 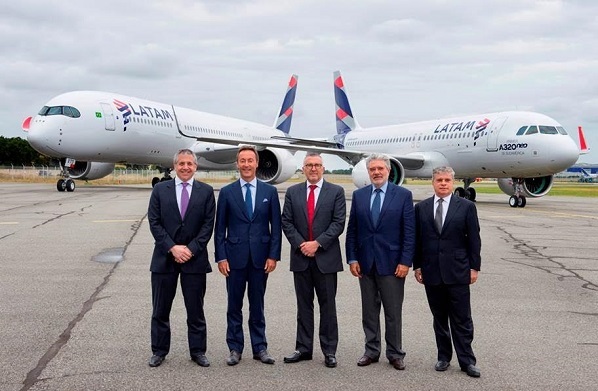 The ultra-fuel efficient aircraft – showcasing LATAM’s white, indigo and coral livery and fitted with Pratt & Whitney Pure Power PW1100-JM engines – was presented to LATAM Airlines Group chief executive, Enrique Cueto. LATAM Airlines Group also received its fourth Airbus A350 XWB – and the first to bear the LATAM Airlines livery – in a joint delivery ceremony. In December 2015, LATAM Airlines Group became the first airline group in the Americas to operate the Airbus A350 XWB. “Once again, LATAM passengers will have the opportunity to be the first in the Americas to fly the latest Airbus aircraft, demonstrating our commitment to offering the most technologically-advanced, efficient and comfortable aircraft,” said Cueto. The aircraft is configured with a 174-seat layout featuring 18”-wide seats and Airbus’s Space-Flex cabin configuration. The A320neo Family incorporates the latest technologies including new generation engines and ‘Sharklet’ wing tip devices, which together deliver more than 15 per cent in fuel savings from the beginning of operations. LATAM Airlines Group has ordered 67 A320neo aircraft – both A320neo and A321neo variants – and is due to receive one further aircraft before the end of 2016. In total, the airline group has more than 250 Airbus aircraft in operation.